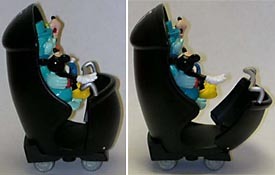 A few years back, Disney started making theme-park exclusive die-cast replicas of the ride vehicles from their various attractions. It took some waiting, but when they unleashed their second wave, there was the doombuggie! 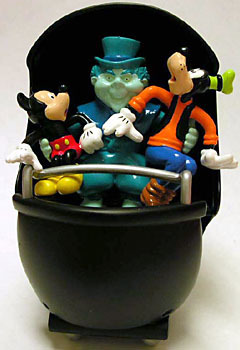 The Doombuggie is actually a cute name for the ride vehicle that is part of the Omnimover system first used for the long-dead Adventure Through Inner Space (in which the vehicles were called "Atomobiles"). The Omnimover system is essentially a circular track that holds, at the Disneyland Mansion, over 200 individual Doombuggies, which are connected to the track by a singular, centered shaft. This shaft is then run through various gizmos to turn guests in certain directions at key points. Plus, the Omnimover track is constantly moving (except for when "playful spirits" interfere or handicapped visitors need to embark or disembark) making its ride capacity not only fairly consistent but also quite high. And while that's all well and good, what about the toy!? The Doombuggie is die-cast metal and rests on a plastic, four-wheeled tray for playability. Actually, the wheels are pretty well-aligned and turn fairly easily so this little thing can actually be launched quite effectively. The leg-guard in front is articulated and can be "opened" or "closed," and the handlebar (which "I will lower for you") is cast in plastic. The whole die-cast line - at least with a smaller vehicle like this one - incorporates various characters having "fun." Here we see the chubby Carpet-Bagger (popularly known as "Phineas") ghost flanked by a shocked and/or terrified (but in a good way, kiddies) Mickey and Goofy. Sure it's... goofy (yeah! Y'like that!?) but it works and is actually kinda neat – and Phineas' eyes, smile, and toe- and finger- nails glow! For the approximately $5 or $6 pricetag on this thing, it's really cool and quite worth it. The whole ride vehicle line is actually pretty nicely, but, of course, the Doombuggie is king (except for the bizarre [though appropriate] number 13 printed on its back). There is a larger boxed line of ride vehicles, but only a couple pieces are in this line, including the Walt Disney World Hearse. Of course it comes with the trademark horse... reign... stuff... that is hovering as if occupied by an invisible and ghostly horse... BOO! Yeah, while the effect is good in the parks, it falls short here, mainly because the reigns just stick straight out rather than arc up like they do on a real horse/in the parks. The other shortcoming is that the "windows" are just black plastic inserts with the curtain pattern (which is only the white tassel portions) "decaled" on. The wheels, horse part, and lanterns are plastic while the carriage body is metal. It's a decent representation, but could easily be much better. Plus, on top of that, it's the WDW version, which is always... see, my home base is Disneyland (the original, Anaheim park) so I will always prefer that Mansion and its gags to any others. Which reminds me, word has it that initially, several years ago, when the die-cast line was first out, a white Disneyland Hearse was also produced, though I haven't actually seen one... something to keep in mind though. What Disney ride would you buy a replica of? Tell us on our message board, the Loafing Lounge.